After the Kickstarter campaign, our goal is to give 20% of profits from each bag sold to set up scholarships for students who want to pursue educational opportunities overseas. Fernweh Smart Luggage recently launched its first crowdfunding campaign on Kickstarter with a funding goal of $125,000. Featuring the Remote Carry-On, which solves a variety of tech and travel needs, Fernweh’s luggage is perfect for business travelers looking for their next adventure. The Remote Carry-On provides USB ports to charge electronics, a fold-out workstation that makes it simple to work from any location, GPS tracking to ensure luggage is never truly lost, and more. The Remote Carry-On offers unique features for world travelers including an OLED display, a smart lock, GPS tracking, a built-in scale, a fold-out workstation, one-button access, two USB charging ports, a durable and lightweight construction, and hollow wheels. A highlight of the Remote Carry-On is the two USB ports and battery that allow a phone to recharge up to three times. In addition, there is a built-in scale in the wheels to ensure that a bag never exceeds weight limits. The Remote Carry-On includes a mesh net inside on both sides to hold clothing and a compartment to store a laptop or other electronics and toiletries. The Remote Carry-On also provides an easy-access laptop pocket making it easier to go through airport security. The luggage itself is made of quality materials, including polycarbonate, leather and aircraft grade aluminum, and weighs 7.2 pounds. The Remote Carry-On is currently available on Kickstarter at a super early bird price of $299. For more information about the Remote Carry-On, visit the campaign at bit.ly/remotecarry. No strangers to the travel, business and design worlds, Dujon Smith and Beau Reid wanted to put the “travel” back in “business travel” and create an experience that increases the pleasure of traveling without feeling like you are at the office. Smith’s experiences while traveling abroad inspired him to pay it forward by giving 20% of profits from each bag to scholarships that allow students the opportunity to travel overseas. 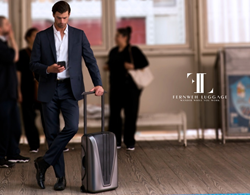 For more information about Fernweh Smart Luggage, visit http://fernwehluggage.com/.